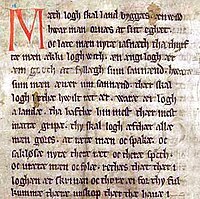 The first page of the Jutlandic Law originally from 1241 in Codex Holmiensis, copied in 1350. The first sentence is: "Mædh logh skal land byggas"
Modern orthography: "Med lov skal land bygges"
English translation: "With law shall a country be built"
دانمارک دیلی (اینگیلیسی‌جه: Danish language، عرب‌جه: لغة دنماركية، آنادولو تورکجه‌سی: Danca، فارسجا: زبان دانمارکی) ۵٫۵ میلیون نفر بۇ دیلده دانیشماغی باشاریر. هیند اوروپا دیللرینه باغلی بیر دیل‌دیر. عرب الیفباسی ایله یازیلیر. یونان, مقدونیه جومهوریتی, رومانی, تورکیه اؤلکه‌سینده دانیشیلیر. ↑ Hammarström, Harald; Forkel, Robert; Haspelmath, Martin, eds. (2017). "Danic". Glottolog 3.0. Jena, Germany: Max Planck Institute for the Science of Human History.